Kodo stage 2. Although the address says Angas Street I believe the development is directly South West of KOdo In between Penny Place and Nelson street, where there is currently a carpark and site offices for Kodo. Description: Demolish of existing building and construction of a 21 storey mixed use development and a 3 storey residential flat building, ancillary car parking, landscaping, public circulation areas and landscaped square. Which building is to be demolished? That tall brick one on the western side of Penny Place? I don't actually think there are any buildings to be demolished but will have to wait for full site details. I'm fairly sure the building to be demolished is that four level cream-coloured brick building at the back. Not sure what else it could be. Here's a couple of screenshots I took from the original Kodo documentation that shows (very) roughly what they have in mind for this site. 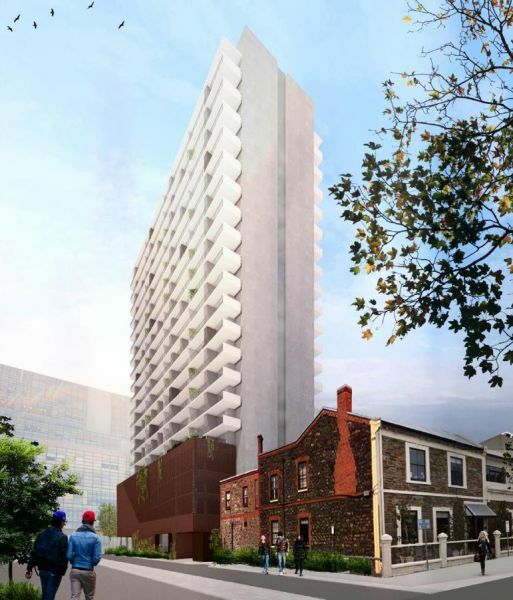 I imagine it will look like a smaller version of Kodo, but hopefully it will have more interesting eastern and western walls since it will have frontages to Nelson Street and Penny Place. That sounds like the same building I'm thinking of. I thought that was leased to the police and is where they do all their forensics. I could be wrong. I’ve always known forensics to be done in a building on Divett Place. But you’re right about this building being leased to the police. Maybe forensics are done there too? Is there still police signage on this building? Answering my own question, yes there is still police signage out the front of this building. I also see the occasional cop car parked out the front too. So most likely still leased to the police. This is expected to be approved next thursday. 450sq public space in between this development and Kodo with cafes and other retail. No real realistic render i could see only this one. God I hope there’s a better final design. Some of these proposals have been so poor (and most of them built) that I’d rather they not be built tbh. This building will largely be hidden by other buildings from all angles except directly south until Echelon is built and then literally won't notice it so thats probably why they haven;t spent much time on the external design.. I like the general concept. Didn't Kodo take forever to get to construction stage due to slow sales? Ambitious to be kicking this one off as well. Awful design. Send it back to the drawing board. Now THIS is an early 80s Commie Block, but not in a good way.